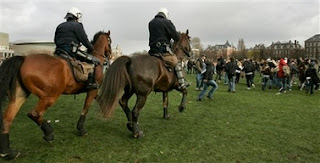 Netherlands - Instead of bringing the traditional apple to school for their teachers students in Amsterdam pelted mounted police with them along with harder things like rocks and bottles and boycott classes altogether across the country. The youths, most of whom are of high school age though some appeared to be even younger, organized their wildcat protests to voice their opposition to proposed legislation that would add another 26 hours of mandatory classroom time to the annual school year. Schools are already required to offer 1,040 hours of classroom time and could be fined for failing to meet that target. Students complain that they will just be forced to sit in more study halls and that the extra hours will not be put to any necessary use. The teacher's union has also voiced opposition to the law. Friday and Monday's protests where held in various municipalities around the nation and were organized by email and text messaging. Besides apples some of the 1,000 plus students who gathered in Amsterdam's Museum Square hurled bicycles at police, smashed shop windows, lit large firecrackers and vandalized cars even going so far as to overturn one and set fire to it. Riot police dispersed demonstrators with a water cannon and arrested 15 people including one individual who after evading officers with assistance from the crowd was dragged to a waiting police transport van by his hair. 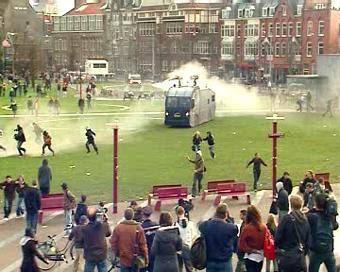 The Hague - Youths egged the Parliament building. Middelburg - 500 Students in blocked a roadway and clashed with baton wielding police officers. Raamsdonksveer - Three pupils were caught and arrested vandalizing school buses. Eindhoven - At least two students were arrested for throwing eggs and fireworks at police during a demonstration. Purmerend - Around 200 protesters blocked roadways and threw eggs at police. Roosendaal - Angry students attacked the local council offices. Parliament is scheduled to take up the issue for debate on Wednesday. It is unclear if demonstrations will continue until then but, the official union for school pupils, who dismissed the decentralized actions as ineffective, have called for their own protests on Friday.